While I don't have examples of many of the common errors, here is a sampling of some goofs. The 'M' is an upside-down 'W'. "Heavy Dot" error- the dot sank to the bottom. A number of plates in this series had the dot in this position. 1980s inverted-letter vanity. I guess they used both of their 'M's in the first half of the plate, because they used inverted 'W's for the second half. A similar error can be found on the map base plates in the '-JWW' series - the second 'W' is actually an upside-down 'M'. 1987 "No Dot" error. The EBL and EBM series (possibly more) were missing the dot. It wasn't long before the dot disappeared again in the FOG series. Although you can't tell from the picture here, this is an error plate - it's not reflectorized. It's not that the glass beads on the numbers washed off, they were never applied. 1988 plate with "half-invert" decal. There are a few of these decals out there. 1989 7-digit vanity?!? ca. 1990s error. This can't be a vanity, because you can't go back-and-forth with letters and numbers. Perhaps this was supposed to be a remake of "929-BKZ"? ~mid 1990s passenger invert. A motorcycle plate in the same style. I'm not sure what the issue was with this plate; it looks like it would be a re-made number from the early 1970s made during the early 1980s. Then the raised areas are painted. 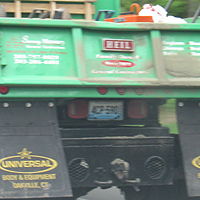 In this case, the wrong color: Red letters are for Commercial/Trailer/Farm etc. plates, not passenger like this one. 2007 Special Equipment Dealer error - the legend should be "Dealer" instead of "Repair". 1976 Parkway Toll plate with an inverted "W" for the "M". Seems to be a common error.